Boxmoor Bottom Lock Winding Hole is a minor waterways place minor waterways place place on the waterways major waterways place village town city on the Grand Union Canal (Grand Junction Canal - Main Line - Gayton to Brentford) between Bulbourne Junction (Junction of Grand Union Wendover Arm with Main Line, Braunston 55¼ miles / Wendover 6¾ miles) (10 miles and 2 furlongs and 19 locks to the west) and Grove Ornamental Bridge No 164 (5 miles and ¼ furlongs and 11 locks to the southeast). 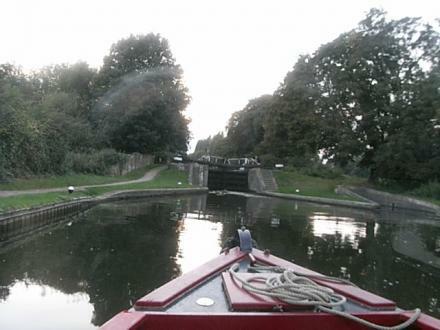 The nearest place in the direction of Bulbourne Junction is Boxmoor Bottom Lock No 64 (Braunston 65 miles); ¼ furlongs away. The nearest place in the direction of Grove Ornamental Bridge No 164 is River Gade Junction; ½ furlongs away. Winding hole just below lock. Next to the lock there appears to be another lock, it isn't, just the overflow system. I guess the space was there for when the canal was to be widened. A better winding hole is next to Bridge 151, into the River Gade. Information last edited Thursday the 25th of January, 2018 at 12:02 PM by Shultzy. Apsey Lock, Hemel Hempstead, HP3 9RH — 1555 yards to the southeast. lawn lane, Hemel Hempstead, HP3 9 — 338 yards to the east. 507 London Rd., Hemel Hempstead, HP3 9BQ — 1056 yards to the west. Jarman Park, Hemel Hempstead, HP2 4JS — 1526 yards to the east. Unit A3, Riverside, Hemel Hempstead, HP1 1BT — 605 yards to the north. Riverside Unit C7, Riverside Shopping Centre, Hemel Hempstead, HP1 1BT — 594 yards to the north. 218 Marlowes, Hemel Hempstead, HP1 1BH — 809 yards to the north. 243 The Marlowes, Hemel Hempstead, HP1 1BL — 639 yards to the north. Debenhams Unit 1, Hemel Hempstead, HP1 1BT — 588 yards to the north. Hemel Hempstead — 1311 yards to the north. Leisureworld, Jarmans Park, Hemel Hempstead, HP2 4JW — 1598 yards to the east. Park Road, Hemel Hempstead, HP1 1JS — 326 yards to the northwest. Riverside Shopping Centre, Moor End Road, Hemel Hempstead, Hertfordshire, HP1 1BT, Hemel Hempstead, HP1 1BT — 624 yards to the north. Crescent Road, Hemel Hempstead, HP2 4AH — 1505 yards to the north. 5 Two Waters Rd, Hemel Hempstead, HP3 9BZ — 188 yards to the southeast. Hemel Hempstead, HP2 4 — 884 yards to the northwest. St. Albans Hill, Hemel Hempstead, HP3 9NH — 1307 yards to the east. The Oval St John's Rd, Hemel Hempstead, Hertfordshire, Hemel Hempstead, HP1 1NP — 507 yards to the northwest. London Rd, Hemel Hempstead, HP3 9 — 1585 yards to the southeast. 10 St. John’s rd, Hemel Hempstead, HP11JR — 218 yards to the north. Riverside Shopping Centre, Hemel Hempstead, HP1 1BT — 612 yards to the north. Hemel Hempstead — 449 yards to the north. 128 Marlowes, Hemel Hempstead, HP1 1EZ — 1307 yards to the north. 16 Bridge Street, Hemel Hempstead, HP1 1EF — 1006 yards to the north. 123 Marlowes, Hemel Hempstead, HP1 1BB — 1125 yards to the north. Hemel Hempstead — 1342 yards to the west. 55 Marlowes, Hemel Hempstead, HP1 1LE — 1402 yards to the north. Kings Langley, Hemel Hempstead — 1284 yards to the east. Henry Street, Hemel Hempstead, HP3 9DU — 633 yards to the south. Jarman Way, Hemel Hempstead, HP24 — 1427 yards to the northeast. Unit 4, Jarmans Fields Leisure Complex, Hemel Hempstead, HP2 4JS — 1623 yards to the east. Hemel Hempstead, HP3 0 — 1421 yards to the southwest. Jarman Park, Hemel Hempstead — 1581 yards to the east. Hemel Hempstead — 354 yards to the north. Hemel Hempstead — 1569 yards to the east. Hillfield Rd, Hemel Hempstead, HP24 — 1123 yards to the northeast. Hemel Hempstead, HP2 6 — 1261 yards to the northeast. 778 yards to the southeast. Station Road, Hemel Hempstead, HP1 1JF — 145 yards to the north. Hemel Hempstead — 328 yards to the north. Unit 226-228 Marlowes, Hemel Hempstead, HP11BJ — 1023 yards to the north. Jarman Way, Hemel Hempstead, HP2 4JS — 1426 yards to the east. 1145 yards to the southeast.